L'Eclair de Genie I started the month of September in France where I visited the amazing eclair shop L'Eclair de Genie. Read more about those beauties in my blog post here. Totally Dublin On my return from France I was delighted to be featured in Totally Dublin. I'm so grateful to Aoife from I Can Has Cook for the article and also to Mark who photographed me. Aoife and Mark are the talented team behind Forkful. Check out their recipe videos, they're amazing! Spiced Butternut squash and Coconut Soup I had a cold after my little trip to France and made this lovely soup. The recipe was on Clodagh Mc Kenna's website only in September but here is something quite similar. French Food and Wine Tours I got some great flyers to promote my food tours and used the amazing pictures taken by Yolene Dabreteau photography. I run tours every Saturday, you should join the fun! Ricard at Le Gueuleton I discovered that you could drink glasses of the French aperitif drink Ricard and it only costs a fiver at L'gueuleton. Santé! Wine tasting Yes I sometimes drink wine during my tours, it would be rude not to! Granby Park I visited Granby Park before it was gone. It was such an amazing space and I'm sad it was only temporary, but you can read about it here. Pastries at Paris Bakery I couldn't believe all the beautiful cakes on display at Paris Bakery when I was picking up a baguette, of course I had to Instagram them. Hello-Nice to sweet you! I bought one of the new chocolate bars by Lindt from their Hello range in Super Valu. I recommend the Cookies and Cream flavour, it's delicious and the packaging is gorgeous. Baked St Marcellin With the change of weather in September I started eating a ridiculous amount of melted cheese. One evening we baked a St Marcellin cheese (bought in Paris Bakery) and dipped some rustic baguette in it. Cheesetastic! Cool neon sign I'm a sucker for neon signs and I love this one 'Meat par excellence' from the FX Buckley butchers' shop on Talbot Street. Duck Burger and chips When we don't eat out Mr. FFID and I love cooking together. We made those amazing duck burgers and chips from Michel Roux Jr's recipe. Duck, Vacherin cheese and girolles, so délicieux! Goodhall's Edible Gallery I attended the preview of the Goodhall's Edible Gallery the night before Culture Night. Here are my four favourite edible works of art. I love the Salvador Dali themed cupcakes. Drinks at Hatch and Sons On a sunny Saturday all the terraces can be packed but Hatch and Sons' terrace is quite hidden from the crowd and a nice spot to think of. I had some delicious Orpens Cider and himself got an ale by 8 degrees brewing. They serve the drinks in the coolest tumblers ever! Walnut and Cinnamon scroll There's nothing more comforting than a walnut and cinamon scroll from Brother Hubbard, I enjoyed it while sipping some tea with Yolene. Voila! September was a good foodie month for me overall, it flew! I was also delighted to have my food tours mentioned in both Easy Food and Food and Wine Magazine. 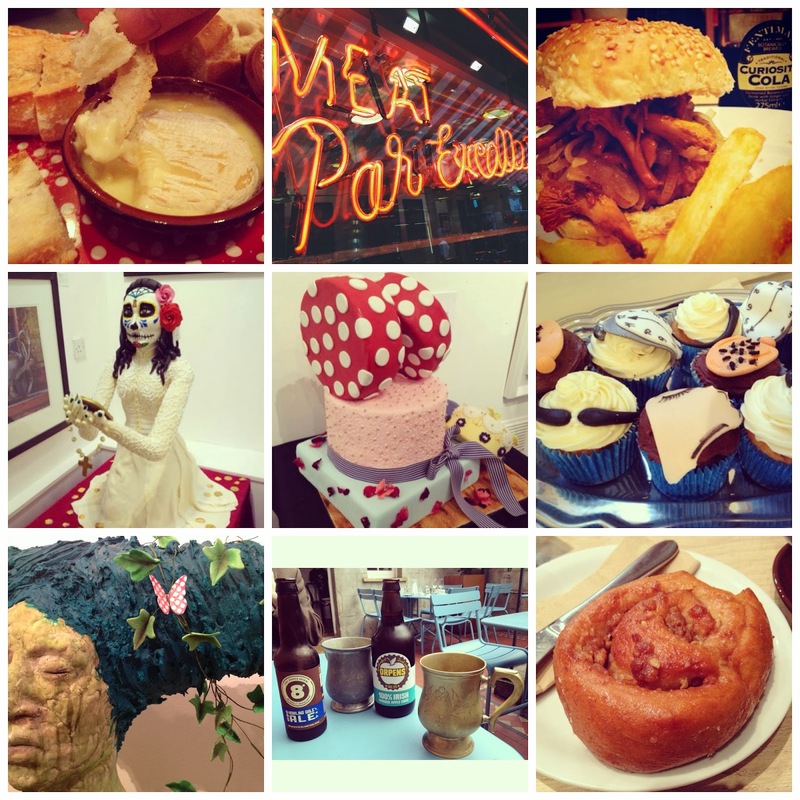 I hope you enjoyed my Instagram round-up! 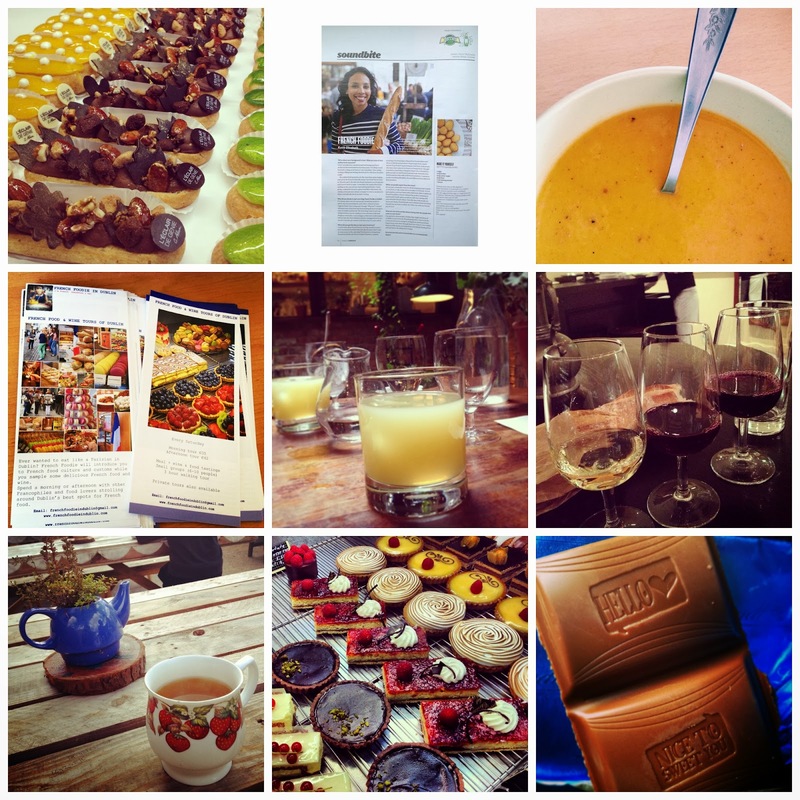 I have to confess I'm a bit of an Instagram addict, you can follow me here if you wish. Last but not least French Foodie in Dublin is a finalist in 2 categories (personal and newcomer) at the Blog Awards Ireland. Wish me luck!